I've stitched my version for a very dear friend - the same friend who taught me how to cross stitch these many years ago. She loves that shade of pink-bordering-on-red and also loves very feminine things, so I think I've captured her taste fairly well. I've used her maiden name, and the year we met (minus 100, to keep with the vintage style of the piece). I chose a goose/swan for my bird because of the associations with loyalty, love, and steadfastness - as well as both birds being known as very protective mothers. Sara is a dedicated mother, wife, and friend and I wanted to chose a bird that reflected these traits of hers. I've finished it off with some shell buttons, rick rack, vintage lace and a tiny key. 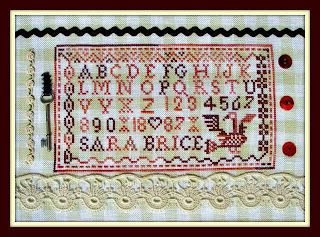 Hopefully, I'll find time soon to stitch this one for myself, using the name of my great-grandmother. I love yours too. Aren't they all just wonderful. I'm going to add some lace to mine too. My mother gave me a box of lace that was my grandmother's so I think it will add to the specialness of it. Very pretty.